Puerto Rican rock icon Draco Rosa has released the official music video for new single “333” off his upcoming album Monte Sagrado. The video was created by the Colombian animation team SHARPBALL and inspired by the world inside the album’s cover art, originally designed by Draco’s son Revel Rosa. 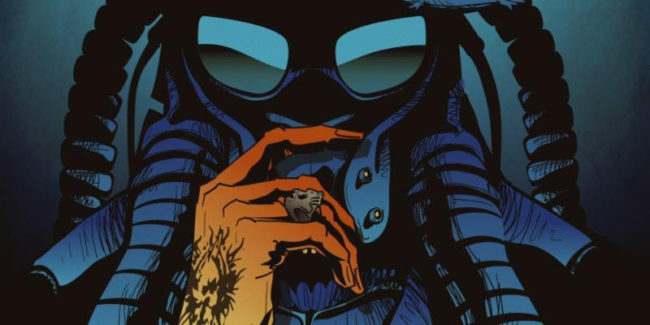 Los Hermanos Jimenez found inspiration in Blade Runner, Batman mythos and anime classics for reference points in creating the “333” video. “What really drove the look and feel of the project was the chance to upgrade a nostalgia for late Seventies and early Eighties sci-fi: something we found to complement the music in the same context; the old school stoner prog build of the song plus the haunting but sludgy groove,” Jimenez explains. 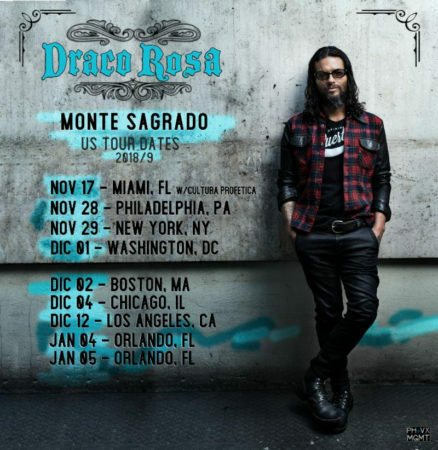 Monte Sagrado, set for release October 26, is Draco’s first album of all new songs in 9 years. It was conceived while Dracowas at something of a crossroads in his life. Having spent years in and out of doctor’s care due to the onset of non-Hodgkin’s lymphoma, he decided to spend more healing, surrounded by his 100 acre tropical rainforest in Puerto Rico where his love for coffee and agriculture represents an escape from the chaos that was surrounding him at that moment. While recording Monte Sagrado, Draco decided to focus on old school basics, using standard rock instrumentation and the energy of “live” analog recording. But even though he was ecstatic about the way the rough tracks turned out, the process of putting together the album was interrupted by the devastating destruction of Hurricane María, which paralyzed Puerto Rico for months. Draco is a multiple GRAMMY® and Latin GRAMMY® winner, inductee of the Latin Songwriters Hall of Fame, a bilingual, bicultural poet, visual artist, and explosive live performer. The journey of his life—from teen pop star to purveyor of poetic darkness, genius latin/crossover pop songwriter to philanthropist and entrepreneur—has had so many twists and turns it can make your head spin. The last few years’ battles and triumphs finally led Draco to make a personal spiritual climb back to his Hacienda Horizonte (his mountain estate) in Utuado, Puerto Rico, his homeland. Nine years after his last original project, Amor Vincit Omnia, which was also recorded in his self-constructed studio, he’s made his latest visionary artistic statement: a collection of high-voltage rock and psychedelic musings titled Monte Sagrado. In many ways, Monte Sagrado will be seen as a newly energized follow-up to 1994’s Vagabundo, which was originally produced by Roxy Music guitarist Phil Manzanera in London and re-released last month after 22 years at #1 on Nielsen’s “Latin Catalog Album Charts”. Yet perhaps because it comes out of a period where Draco feels “really healthy and energized,” it contains all of Vagabundo’s mystic genius while pushing the music to even greater heights.